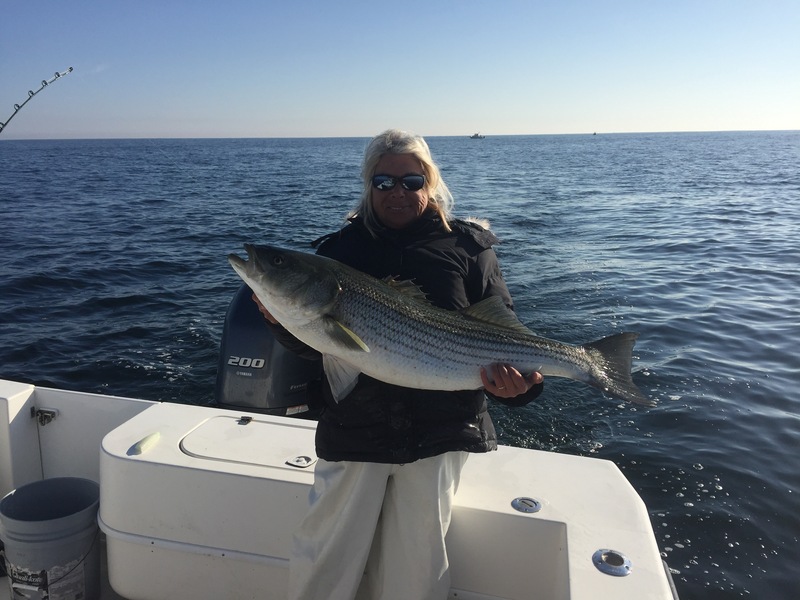 Today I ran Maureen Klause’s 27′ Contender to go look for stripers on 16# test. We had absolutely amazing weather, flat calm, sunny, and temps in the upper 50s. The water was clean and 51 degrees today. We ran out of Great Egg Inlet and pointed the bow North. We stopped earlier to work a few lumps on the way up but we didn’t see much going on and heard there was a bite further up LBI, so we made the sprint and got in the mix. 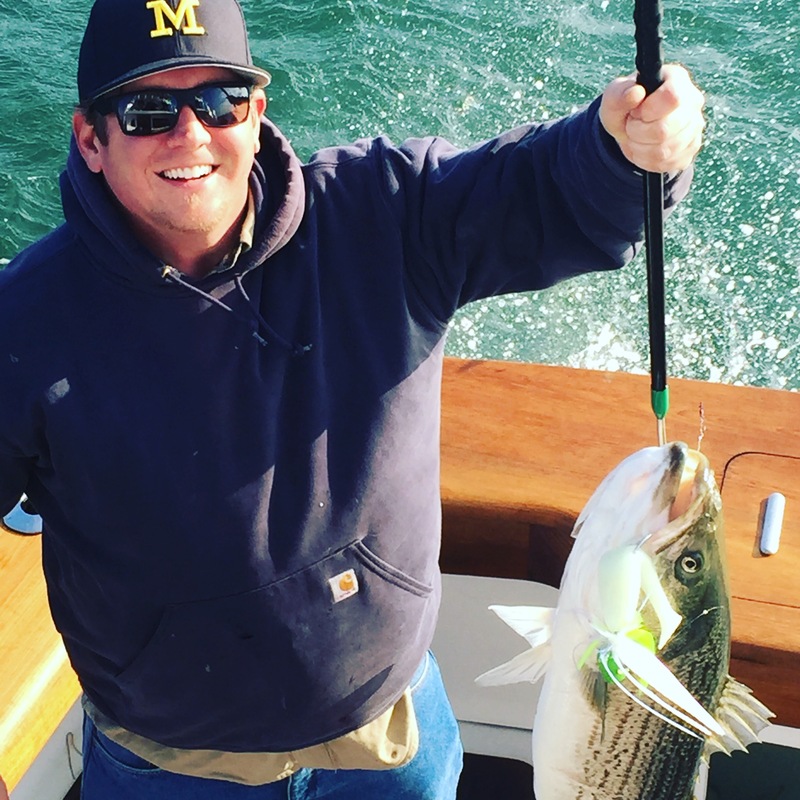 The fleet was thick but we did manage to pick at a few quality stripers primarily on Mojos. We did catch one on a purple Bomber too. We moved around a couple times and had no success but on the way home we saw a massive bird play just barely outside that pesky 3 mile line. We trolled tight to the line and picked up a couple more stripers that we released and the birds and fish continued to move offshore so we called it a day and headed home. No record fish today but great day on the water! 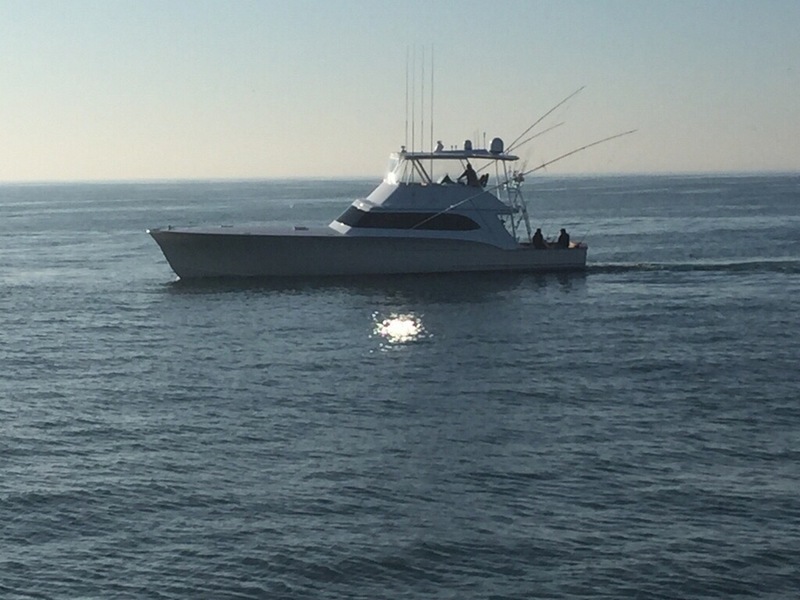 Well today we had it in the plan with today’s charter aboard Exile 65 to waste no time and make the run to the North looking for stripers. We got setup just after first light and things weren’t looking good. The water was dirty, 49 degrees and not much bait. I got a few reports of a hot bite so we ran a little further and got into the mix right away. 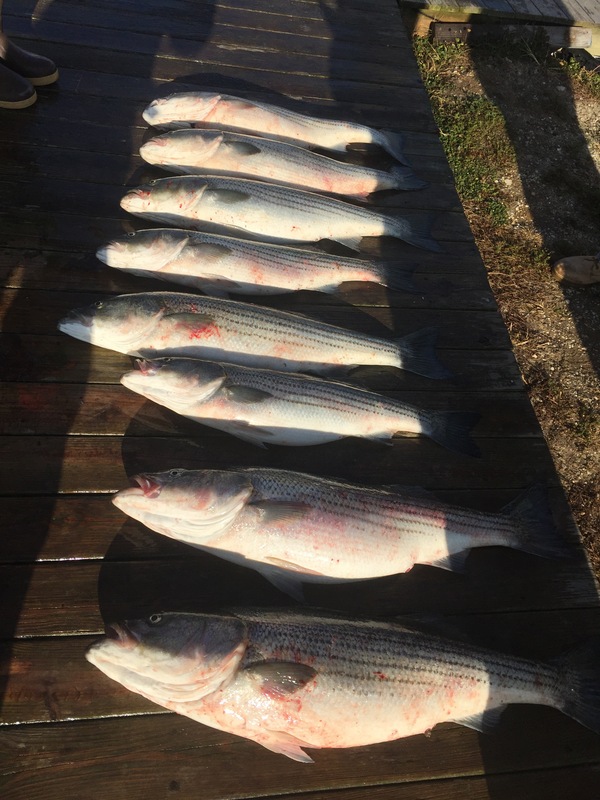 We were trolling mojos along the 3 mile line and consistently picked as stripers from 8am until 11:30am putting out limit in the box and then some. Great day on the water. 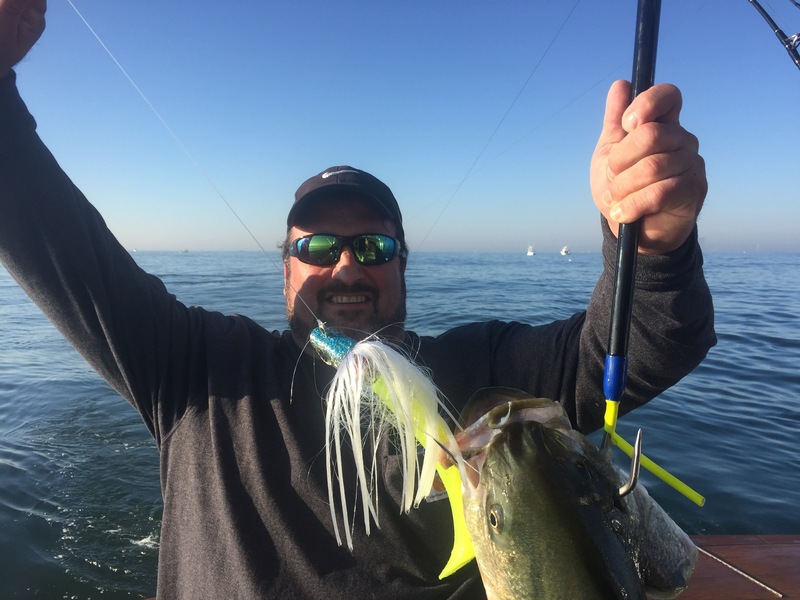 Plenty of laughs, great fishing action, and beautiful sunny weather. The hot bait today was the Fish Downsea 16 ounce Chartreuse Mojo. 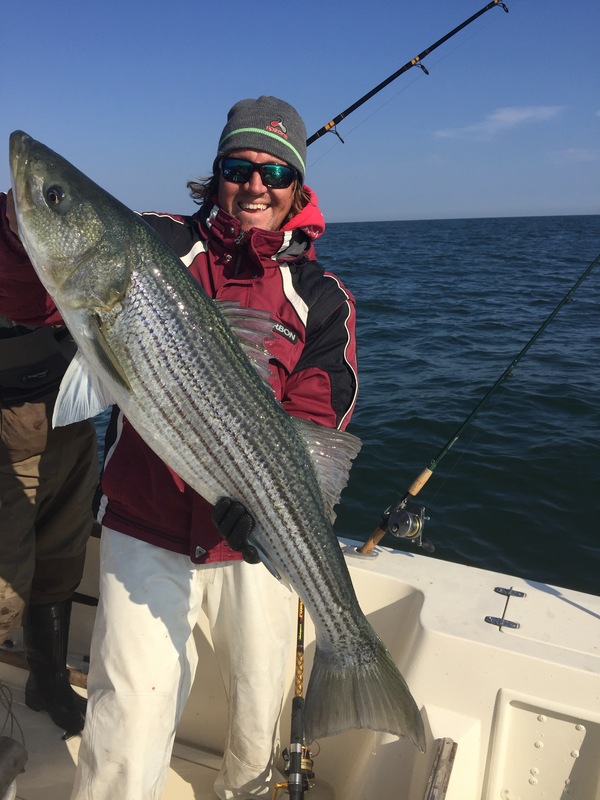 There have certainly been a ton of scattered striper reports over the past few days from terrible to phenomenal. Basically what it comes down to is getting out there and capitalizing on opportunities. We ran out today on Exile 65 at first light and got on the bait right away down deep. We trolled a few local Lumps and tried to fish with live bunker for a couple drifts but no bites. 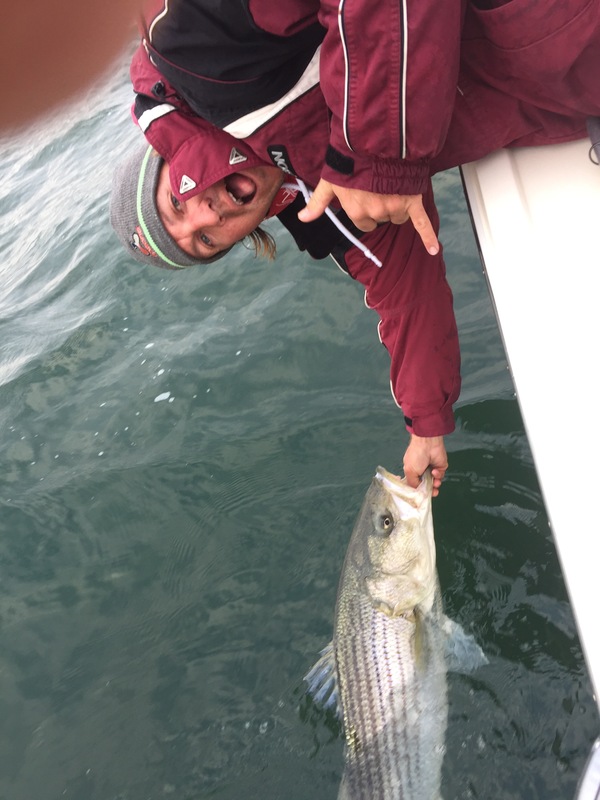 We ended up running north to find a few fish and managed to go 3/4 on stripers. We had a solid NW all day and fished 52 degree water for the majority of the day. As it has been, there was no shortage of bait up and down the coast and a few whales in the mix. Our largest fish today weighed in at 32 pounds. 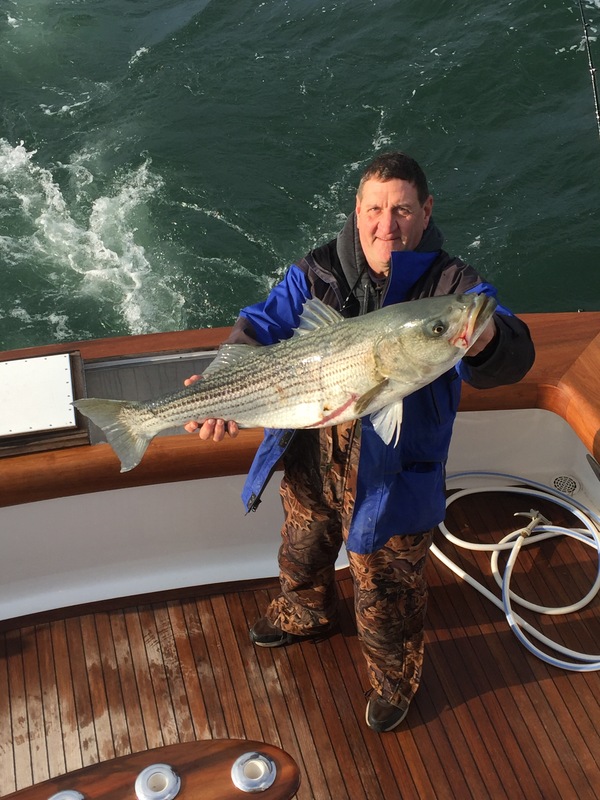 Today we ran a charter aboard Exile 65 in search of striped bass. 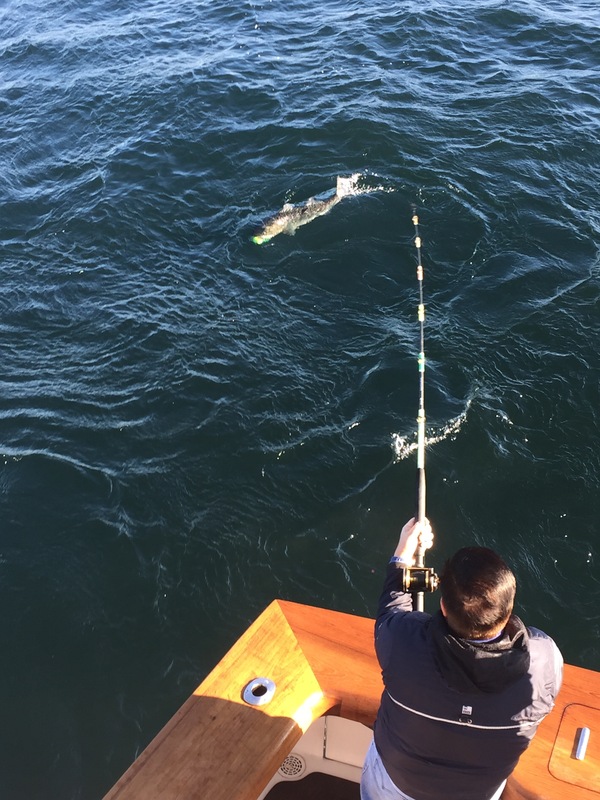 We made our way to the north and got on a slow pick right away managing to put 3/5 in the box trolling Fish Downsea Mojos with 9″ shad bodies. As usual, White and chartreuse produced. There was loads of bait on the sounder and the occasional whale all day with water temps at 55 degrees. We worked the area for awhile then moved southboff of Atlantic City where there was a slow pick. We managed to pull the hook on 3 more stripers as the day went on. Tough luck, but overall it seemed we should have been happy with what we caught. All bites were on mojos. Beautiful day on the water! Today we got a late start out of beautiful Barnegat Bay. Wenheaded south where the bite was early in the morning but it was over when we arrived. We stuck around and caught some bunker for bait, but no bass. We made the run back to the north and got on fish right away catching a few in a short blitz on bucktails. The fish were mostly on peanut bunker up north of the Inlet and most fish were in the 22-30 inch range. We picked at them here and there on bucktails and managed to get one on a whole bunker but it was a scattered bite all afternoon. The fish were finicky but we still managed to have some fun action and put two in the box. The action continued for us again today. 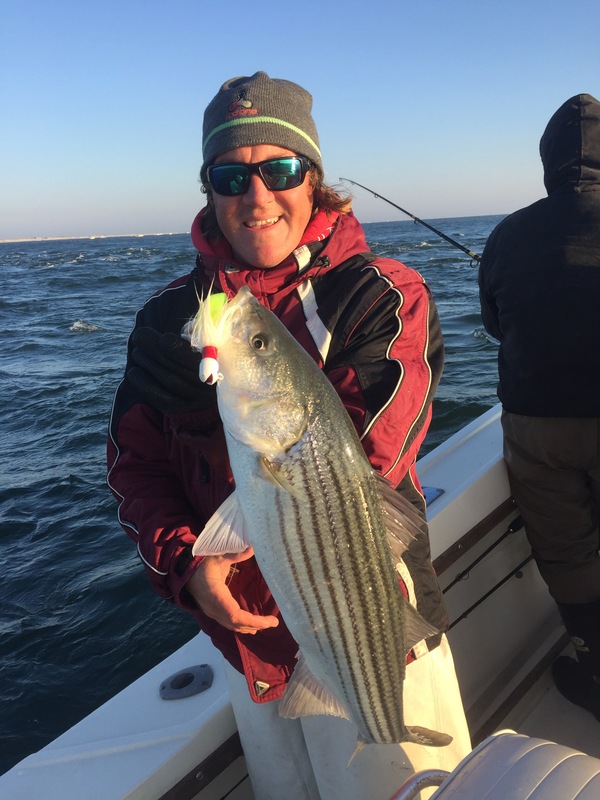 It started slow for us, but we picked at a some smaller stripers on bucktails early. That bite was short lived since the big 10-12 pound bluefish came in and took over. We made our way back to the general areas we fished yesterday and found the bunker and whales were around, but we only pulled one striper out of that mix and there didn’t seem to be as much activity. We picked up and monied around to the north looking for something different to get into. 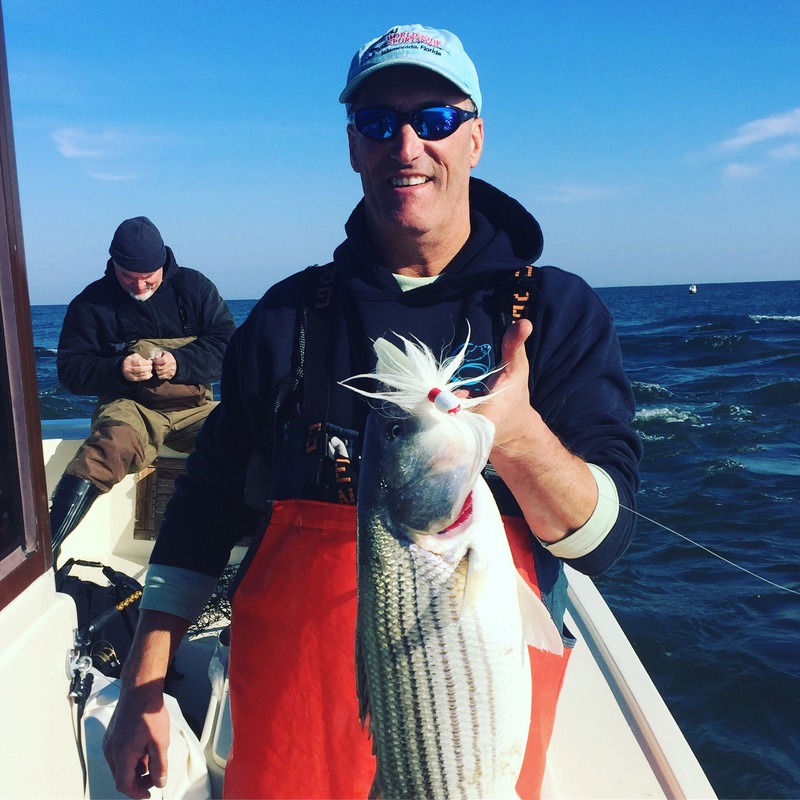 After hours of nothing we saw the striped bass rolling on the surface and were able to catch our fair share on bucktails. Very fun fishing but that bite was very short lived and again bluefish took over. 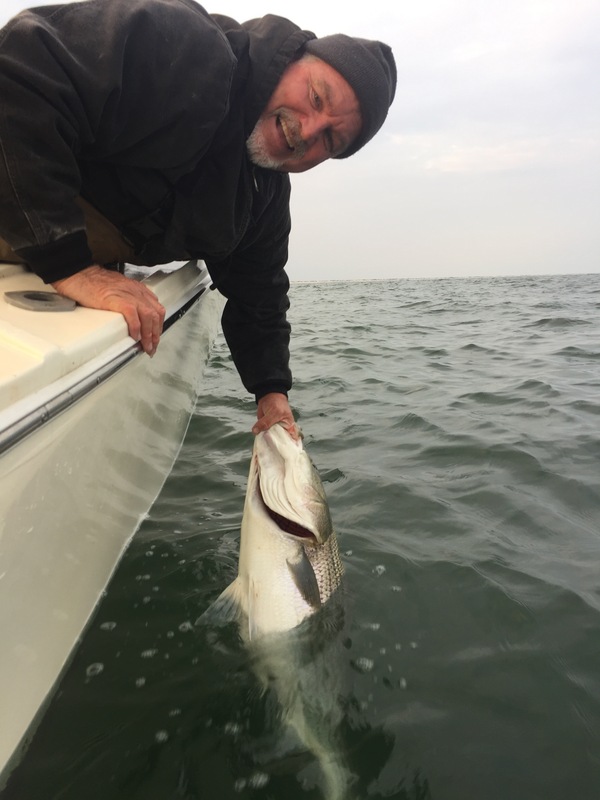 We went on to get a lot of big bluefish which made for plenty of action and lucked out on two more all out blitzes on the surface wth the stripers. Pretty tough to beat seeing that and getting to be a part of it. So much fun and a great day on the water with great friends. Today I fished with some friends on a 24′ Mako and as we made our way out we were lucky enough to stumble upon some smaller stripers. 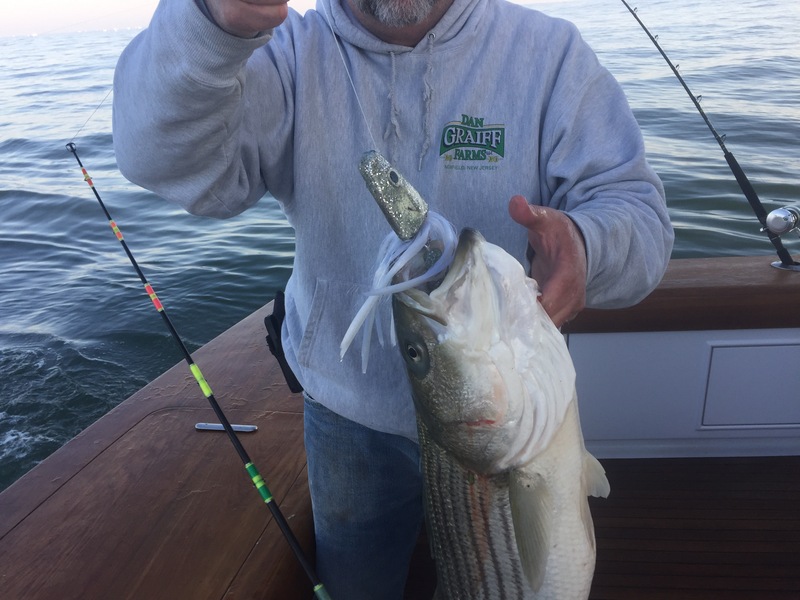 It was game on for us all morning with stripers ranging from 22-30 inches. All they wanted were 3 ounce bucktails tipped with 6″ shad bodies. Awesome action and we went on to catch and release easily over 30 fish. As the tide began to slow the water got dirty and the bite slowed so we decided to take a ride South. We ran for a bit down the beach in 40-50 feet of water and stumbled upon a whale into the bunker thick from 30-45 feet down. We started snagging the bunker with the snag hooks and loading the livewell. We let one out on a circle hook and it didn’t take long for a striper to find it. Game On! 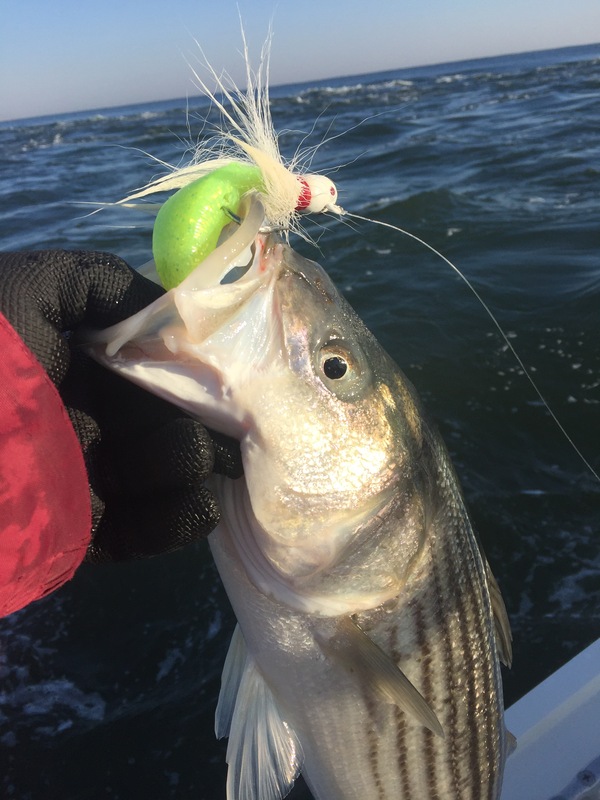 We continued to follow the bunker school around by resetting drifts when we marked the bait and picked at 2-4 stripers per drift for the remainder of the day. 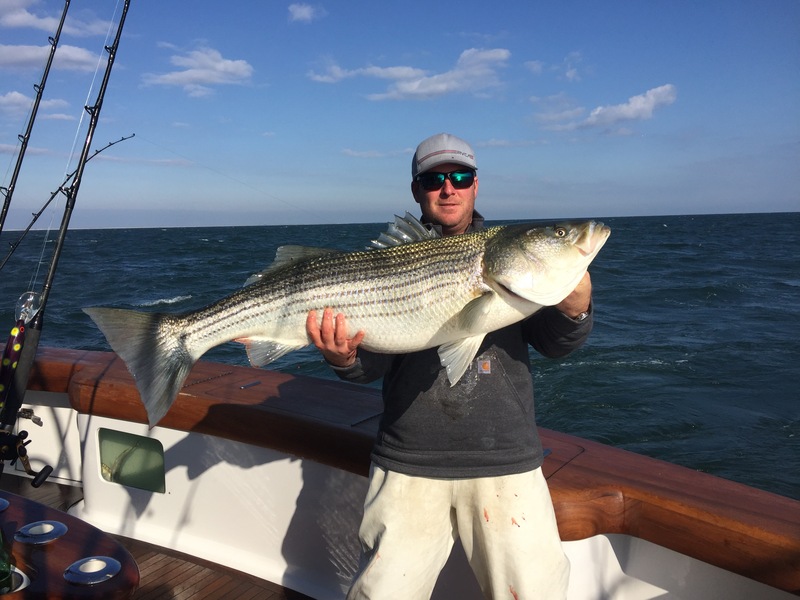 The fish on the snag and drop all were 36-45 inch stripers. Awesome action and a lot of fun!! !